It’s been over a year since the highly anticipated MMO entry into The Elder Scrolls franchise was supposed to originally come to consoles. The Elder Scrolls Online: Tamriel Unlimited was hit with a massive delay. With the PC version already out, excitement was waning for this game as time went on, and I personally feared what it would do for its success. Could Bethesda reinvigorate the brand enough over a year later to push console players to jump into a genre normally reserved for the PC masses? If the server traffic during the first couple of days is any indication, the answer is a resounding yes. Let’s get this part out of the way, yes, the release day servers and perhaps the first 48 to 72 hours following the game’s release were a mess. Like opening a store for a great sale around the holidays, the servers were bombarded with requests to get in, requests that the servers couldn’t possibly process all at once. I’m not a technical engineer, and I’m not going to pretend to know how all of that works, but since those first problems, I have not run into any other issues with being queued up or found myself faced with any extended load times into Tamriel. Those release day problems will not be factored into my final thoughts on the game, but I thought it prudent to mention this if past issues with too many people trying to play a game all at one time somehow impact your decision on that game today. TESO:TU is a ridiculously huge game with tons to do. After an in-depth character creation in which you choose your race, class, faction, and of course, detail how you look, you must escape a prison which acts as a small tutorial on combat, equipping gear, and ability usage. 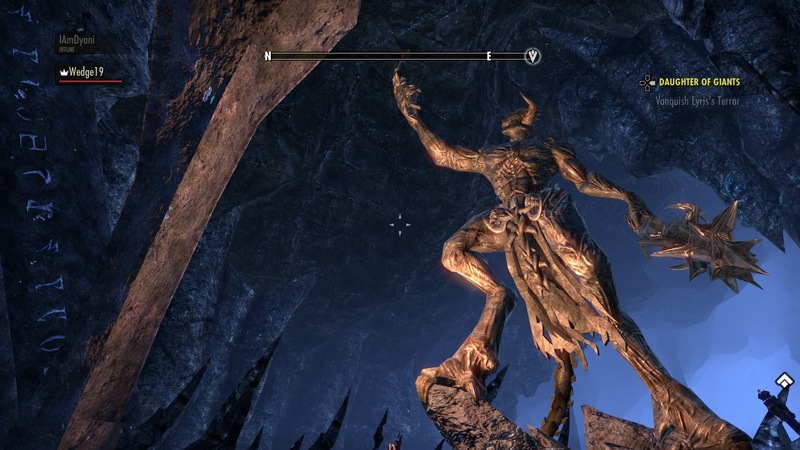 Not long after you start, you find yourself in your particular corner of Tamriel — depending on your chosen faction — with a seemingly endless supply of quests and tasks to undertake. Don’t be intimidated. You’ll want to do these quests quickly and get yourself leveled up as fast as possible. The opening starts off more like a solo open world RPG. 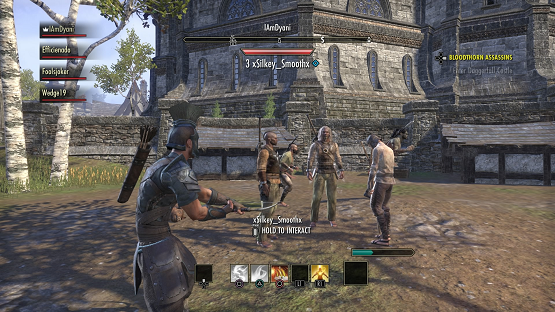 While you can still group up, you won’t have access to a lot of the more enjoyable group activities, and as quests are instanced to each individual player, there’s not much reason to group up early on aside from just hanging out with friends in Tamriel (which is admittedly pretty cool in its own right). One thing that I do wish was taught a little more clearly early on is the crafting system. I spent a long time figuring all of it out for myself, but outside of the early quick combat tutorials, there is very little hand holding. TESO:TU is a very complex game with a lot of nuance, so if you feel the need to be guided every step of the way, you may want to either avoid the game altogether, or find a really good group to play with that can help explain things you may not understand. I’m fortunate enough to play with a guild that has certain roles, such as a blacksmith, a clothier, etc. so I never felt the need to master every single skill and was able to focus my attention into one or two things I would personally use more. Being an Elder Scrolls game, combat is a central mechanic and it’s incredibly easy to execute everything you need to with the controller. Being able to switch between first-person and third-person on the fly is a great touch. Abilities can be mapped to select face buttons and the front triggers, so it’s easy to throw out aggressive abilities, or heal yourself and those around you. Weapon attacks are done using R2, and holding the button initiates a heavy attack. Blocking is mapped to L2. There is no option to change the controller layout or remap your buttons directly in game, which I never found to be an issue. If you really must remap your controls, don’t forget that the accessibility menu in the PS4 will allow you to remap your controller layout. While it won’t be a native layout to the game, it still achieves its purpose. The PC origins of the game are evident in some cases, such as navigating your inventory or the journal, particularly as you get more and more items and quests to scroll through. There isn’t an easy way to organize items or mark inventory to keep versus throw away, so I found myself spending far longer at merchants and crafting stations than I would have liked. In a game as massive as this, it’s a shame that so much of my time needs to be spent on inventory management because there isn’t an efficient organization system in place. Level 10 is when the game really starts to hit its stride. This is when the PvP mode in Cyrodil unlocks, where you can team up with your faction to face the other alliances in 300 player battles — 100 per faction. The PvP mode could be an entire game within itself, having a massive map, a variety of missions to undertake to help give your team the upper hand, and fun combat versus other players. Though it does unlock at 10, it may not be enjoyable until later levels as you build up your abilities, but the option is at least there. I also have to mention the group dungeons, which offer four players the chance to take on a dungeon tactically in a more traditional MMO format. Players take on roles such as healer, tank, or DPS (damage-per-second) in order to make their way through these challenges and emerge victorious. In these sections, teamwork and communication is key, and they really highlight the online aspect of the game. That’s not to say it isn’t present elsewhere. If you come upon a boss when other players are near, everyone will be able to fight it, whether they have that mission or not. The world is quite alive with other people, and even with as massive as it is, I have found no shortage of live human players in any area of the game, though the game does tend to stutter quite a bit in the more populated central hub areas. 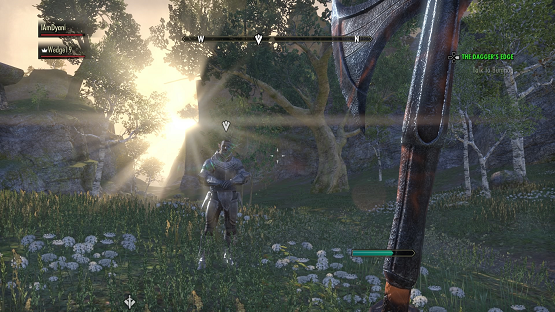 The Elder Scrolls Online: Tamriel Unlimited is a long term commitment. It is a game that is meant to be played over time, with nuances to the game that you may never even encounter, depending on how you decide to play the game. Fortunately, there is no subscription fee for console players, which removes a huge barrier of entry, and though it is an MMO, it strikes a balance of being enjoyable enough to play solo as well. If you’re looking for Skyrim Online, you won’t quite find that depth here, but the sheer magnitude of The Elder Scrolls Online: Tamriel Unlimited makes up for it, and there’s nothing quite like running into your friends while questing across Tamriel. The Elder Scrolls Online: Tamriel Unlimited review code provided by publisher. For more information on scoring please see our Review Policy here.